Top South African mountain biker Candice Lill finished her first Absa Cape Epic in 2017 “hungry for more”. Lill used last year’s race as preparation for 2018, a wise head on young shoulders discovering what the Untamed African Mountain Bike Race was all about. “I had a very good experience at my first Absa Cape Epic, which is exactly how I wanted it to be,” said the 25-year-old Lill. “I had no pressure. I was there to experience, learn and grow. I finished most days with a smile on my face because I had prepared and was ready for how tough the race can be. 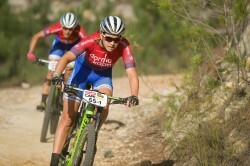 Lill finished sixth in 2017 with Namibian Vera Adrian, but will race the 15th Absa Cape Epic with Adelheid Morath of Germany for Team dormakaba. Morath, who will ride in her third Epic, was fourth last year with Ariane Lüthi, the three-time winner of the Women’s category.